Doug's brother, Adam, reasoning that many who knew and were touched by Doug during his life might want a place to go to remember him, set out to establish a physical memorial. 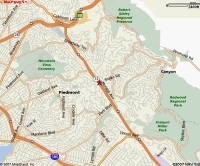 Montclair Park, in the Oakland Hills, would be an appropriate place, since it was so central to Doug's youth and his friends. Choosing the place proved to be the least of the hurdles for Adam, though; negotiating the Oakland Parks bureaucratic procedures for even donating a bench in a park proved to be a challenge. 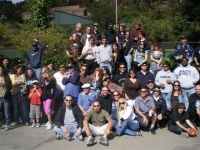 But on May 12, 2007, it all came together in a wonderful gathering. Please click on an image to be taken to a larger version with more information. The bench, veiled, awaits the ceremony, as do waterfowl in the background. More than a hundred people gather before the ceremony. 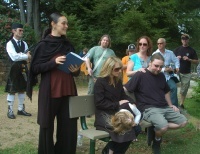 Family members sat on a small stone wall adjacent to the bench during the ceremony. 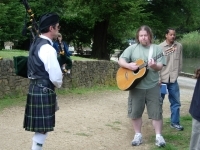 Jeff Campbell, Bay Area bagpiper, plays Amazing Grace. Campbell and Jim Adams play a bit of AC/DC's "It's a Long Way to the Top..."
Doug's sister, Reva, is the first to offer reminiscences and thoughts. Adrianne and Grace (the truly amazing Grace!) listen on Daddy's bench. 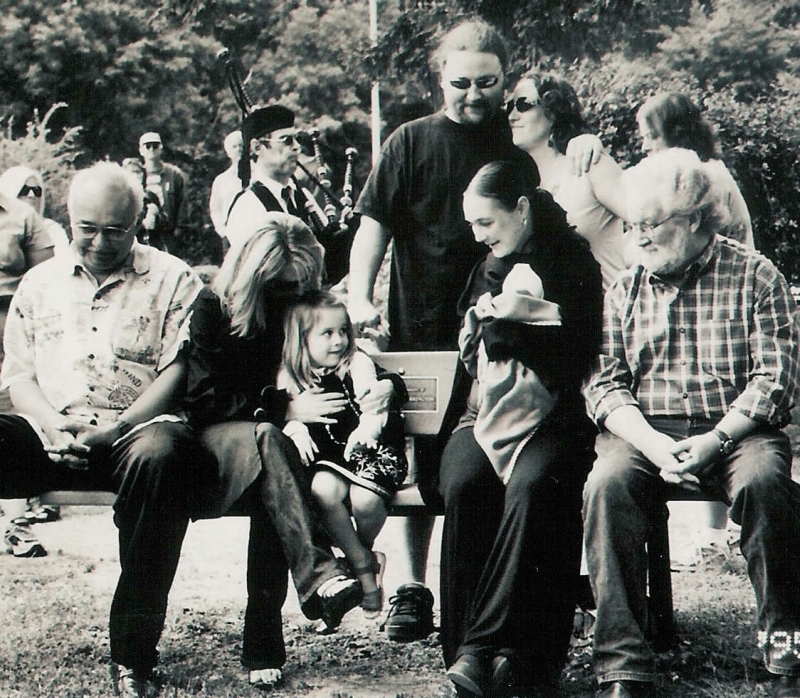 Many friends approached the bench and talked about Doug. Please visit the video part of this Memorial Bench website to see and hear them. Adrianne listens and remembers as Dave White performs "In Memory Of..." on her husband's bench. Attention turns, as it must and as it blessedly heals, to the next generation: 4-year-old Grace... and 1-week-old Kiana Mari Kidd Hollis, Reva and David's brand-new daughter! Fittingly, after the ceremony, it was party time. Lara Hoeber captured many, many great photos during that time; you can see them by clicking on the image above. 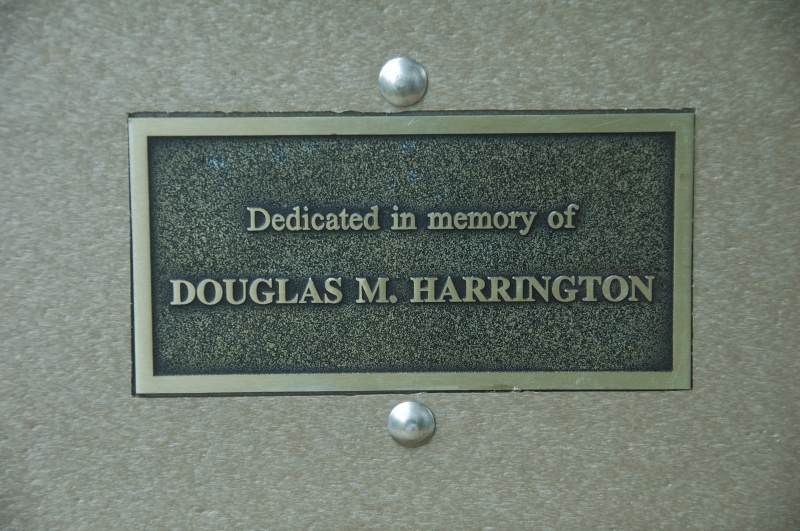 The Douglas M. Harrington memorial bench after all the hoopla, at work for any who need it in Montclair Park.